· How long is the process? We ask a minimum of two weeks from start to finish. However, every estate is unique and requires special consideration for scheduling purposes, depending on the size of the estate. This and more will be discussed during your initial, no-charge consultation. · Are there any monies due upfront? Dallas Estate Sellers operates strictly on a commission only basis. Our fees will be deducted at the conclusion of your sale. We will never ask for any upfront monies or a deposit to conduct your sale. · What do I do to get ready? Just call and set an appointment for your initial consultation. If you decide to work with the Dallas Estate Sellers team, the next step will be to select a date for your sale. Remove/segregate any items ‘Not for Sale’ and then hand over the keys, sit back and relax. We do the rest! · What happens to remaining items not sold during the estate sale? Our goal is to liquidate as many of your estate items as possible – through proper pricing, staging and advertising. However, there are typically some items left at the end of each sale. Ultimately, all remaining items are your property but we can advise you about a number of options including donation to a charity, and/or names of local buyout companies that may be interested depending on quantity/quality of items that are remaining. We are happy to provide you with this value-add service as a way to make the entire estate sales process easier for you, your family and your schedule. · Do you consign/have a store front or take the remaining items? We DO NOT consign, own a store front or take any remaining items from your sale. A handful of companies do practice these standards, however, Dallas Estate Sellers does not. You could lose potential profits to a company pricing your items then turning around to buy them for themselves to resell. · When do I get paid? Immediately. While some companies may make you wait up to ten business days we take great pride in being able to give you a check, on your premises, at the conclusion of your sale. This will also include a summary of the sale for your records. · What is your rate? 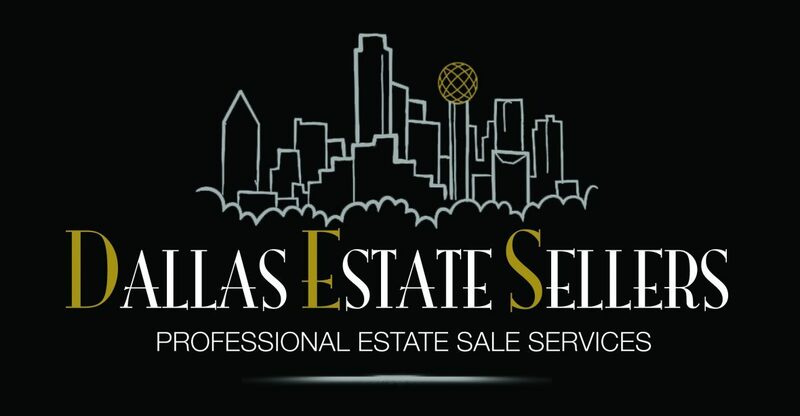 Estate sale standards for the DFW Metroplex are between 35% and 50%.. Dallas Estate Sellers charges 40%*of the sale. That means 60% of the proceeds go directly to you and 40% going to the company of the overall total sale. Remember this covers everything needed to run a successful sale – from setup, research and pricing, staffing to advertising, staging, and day-of materials like tissue paper, bags etc.. Automobiles sold as part of a sale are calculated as a separate 10% commission of their sales price.